Earlier this year, Sustainable Pittsburgh launched Straw Forward, a collaborative, community-wide campaign involving nearly 40 restaurants, nonprofits, and businesses over a seven-month period. 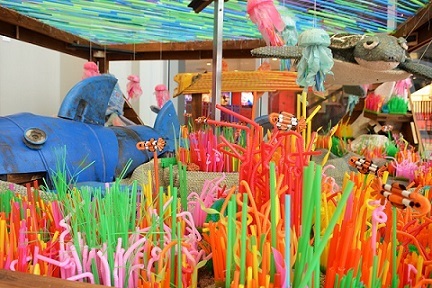 Using straws as the main medium, the Straw Forward team collected used and littered plastic-based items and transformed them into a stunning art sculpture on display through Fri., Feb. 15 in the Riverview Café at the Carnegie Science Center. On Mon., Feb. 4, join Sustainable Pittsburgh, Allegheny CleanWays, Pennsylvania Resources Council, Construction Junction, Sustainable Cleveland, and First Mile of Thread – International, for an insider’s look behind the sculpture along with a panel discussion to learn how these organizations are helping to reduce plastic pollution, raise awareness, and build economies through single-use plastics. In addition to the panel, an abridged version of the documentary A Plastic Ocean will also be screened, providing a deeper look into these issues on a global scale. The event is FREE, but please be sure to register. Follow along @StrawForward on Instagram and/or Twitter @StrawForward for updates and share your pics using #StrawForward!